Six people came to Ukulele Mele On Maui’s Ukulele Strumming Workshop on February 10 at the Bailey House in Wailuku. 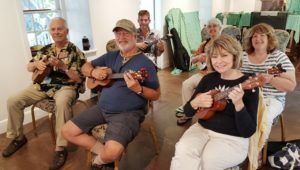 Six people came to my 46th ‘Ukulele Strumming Workshop on February 10, 2018 from 10 – 11 a.m. at the Bailey House in Wailuku. This brought the total to 644 participants since I began teaching these workshops at the museum on July 14, 2012. One lady was so excited to meet me, exclaiming “It’s like meeting a celebrity” because she watches my YouTube channel videos. One man returning from California brought a friend who had seen us at the Shops of Wailea back in 2015 when we entertained and provided free ukulele lessons to the masses who showed up on Wednesdays (read more). One young man mentioned that he is a student at the Institute of Hawaiian Music at the University of Hawaii Maui campus (I have mentored students there). We had a lot of fun playing music with this small group. Horse with No Name – 2-chord song with Chalang-alang Strum. Lion Sleeps Tonight – 3-chord song with I Wanna Rest Strum. She’ll Be Comin’ ‘Round the Mountain – 3-chord song with Hum Ding-Ah Strum. When You’re Smiling – 5-chord song with Hum Ding-Ah Strum. Hawaii Aloha – 5-chord song with Morse Code Strum. LISTEN TO THE RECORDINGS IN THE FREE ONLINE FAN CLUB and then schedule private lessons on Maui or via webcam to get the song sheets and feedback on how to play it. PURCHASE A PACKAGED SONG SET OF BOOK/DVD/CD. Get the song sheets, video lesson, and audio recording for 6 songs with 8 unique strumming styles. Sing-Along Songs, Vol. 1 – She’ll Be Comin’ ‘Round the Mountain plus 5 other songs for beginning ‘ukulele players. Nostalgic Hawaiian Songs, Vol. 2 – Hawai’i Aloha plus 5 other songs for intermediate ‘ukulele players. The next workshop is scheduled for Saturday, March 10. Register now and discover how much fun it is to Watch. Listen. Play. the Ukulele Mele Way. For a listing of all Ukulele Mele products and services, click here.